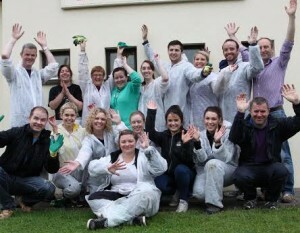 Workers from the Kerry Foods Group in Tallaght visited the Horse Project on one of the only grey days in September. Despite the damp weather, spirits were high and the volunteer staff carried out a phenomenal amount of work. They painted the entire post and rail fence, constructed a gate, cleared away rubbish and carried out substantial weeding; and this all took place on one day. The Board of Management and Staff of FYHP cannot thank the Kerry Foods Group enough for their hard work and we all agree that the place has been substantially improved by their efforts. We would welcome the Kerry Foods Group back anytime. This entry was posted in Events by Dara Larkin. Bookmark the permalink.